Dating back to the eighteenth century, located in the picturesque south bohemian village of Dudove, just south of Prague, nestled between the towns of Tabor and Bechyni. 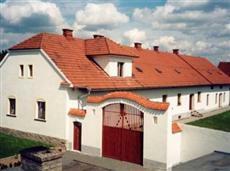 Proferring quintessential Czech farmhouse accommodation a white washed building with a terracotta roof cuts an imposing figure on the country landscape. Tiled flooring, exposed timber beams and rustic furniture creates a unique atmosphere. The accommodation is spacious and comfortable, sleeping up to six people. The residence compromises of two bedrooms, a fully fitted kitchen, a living room and a bathroom all rooms are equipped with all expected modern comforts and conveniences. We offer guests a number of facilities and activities such as an outdoor swimming pool, table tennis, cricket and darts. Indoor pursuits come in the mould of cards, chess, jigsaw puzzles and various table games. Ideal for a family break, you will have an undoubtedly memorable and relaxing visit.